1. 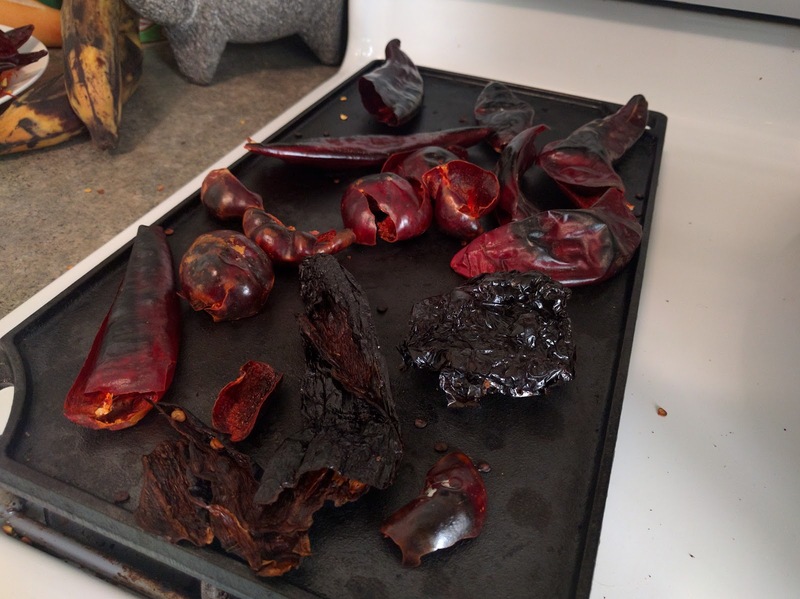 Split open all the chiles and dump out as many seeds as possible. In a large skillet melt lard and lay chiles in the oil. You will begin to see them darken in color. flip occasionally, the goal is to get a pretty dark color on them. This could take 5 minutes or so if you have it on medium heat, some smoking may occur. 2. Remove the chiles shaking off any excess fat and steep in boiled water for 15 minutes (they need to be weighed down, I use an old french press), set aside. 3. In a large pot sautee garlic and onion in the lard used to toast the chiles. Cook until translucent then add spices and stir everything together, letting it cook for another minute or so. 4. Add ground beef, continue to cook until the beef loses it's pink color. Add beer and allow to come up to a simmer. 5. Drain the chiles and add to a food processor with canned tomatoes and tomato paste. 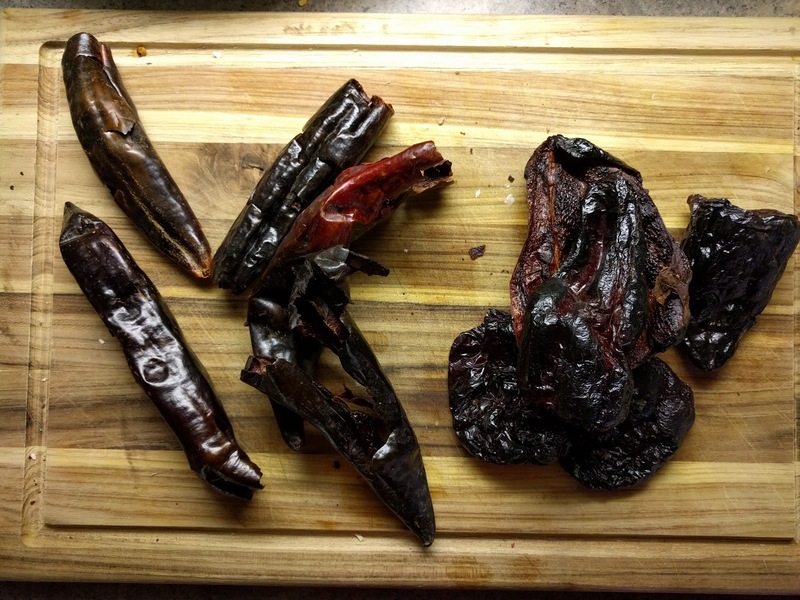 Blend until chiles are broken down and the sauce is fairly smooth. Add this to the pot along with beef broth and soy sauce. 6. Lower the heat and simmer for a few hours. I let it go for 3 hours. 5. Add canned beans and continue to simmer on low for 30-45min. 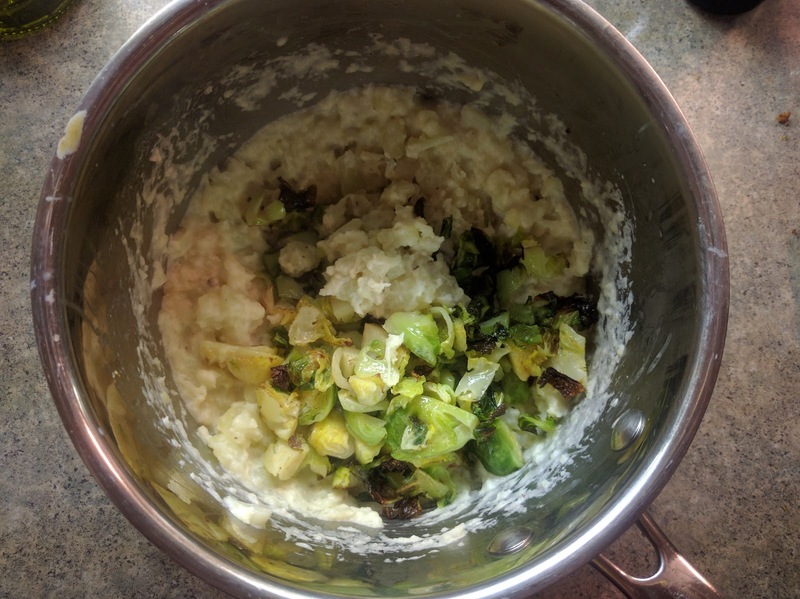 Notes: I added a few canned chipotles to the food processor for more heat and smoke, but this is optional. If the chili seems too thick while cooking, add additional beef broth as you go. Soy sauce adds a good deal of salt. so I do not really salt until after simmering for a while. I try to make it a day before eating, chili is always better the next day. 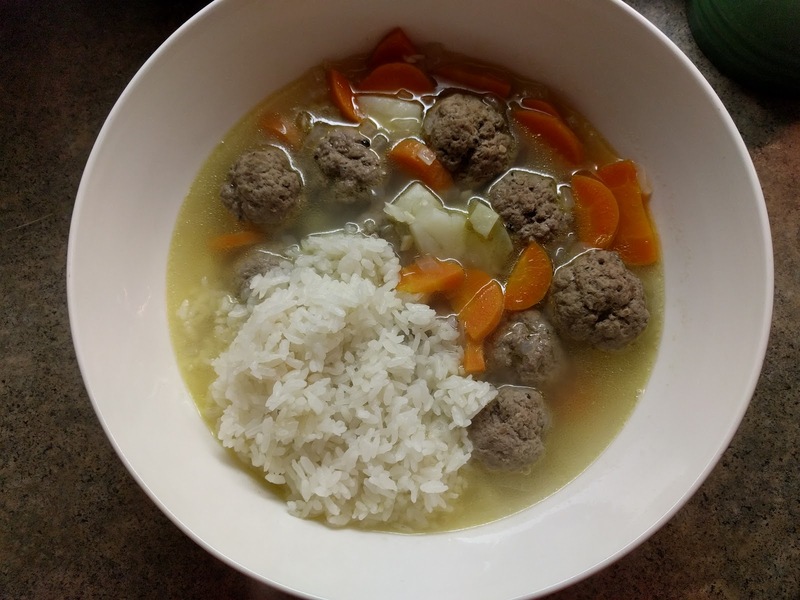 Albondigas is one of my favorite meals. I have strong memories of my mom making this for us as kids. It was a favorite soup served over rice and sometimes with a dollop of sour cream stirred in. I used 1 pound ground beef, 4 smaller potatoes, 1 carrot, 1/2 onion, 4 cloves garlic, salt, pepper, garlic powder. I made white rice on the side but this would also be good with boiled noodles. 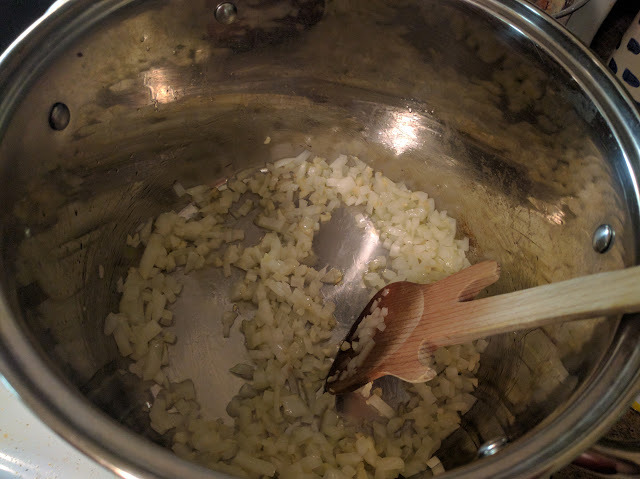 Begin by chopping onion and garlic, and sauteeing in a pot with a little oil. Cook for a few minutes until the onion starts to get translucent. Top with 3-4 cups water and allow it to get to a boil while you prepare the rest. 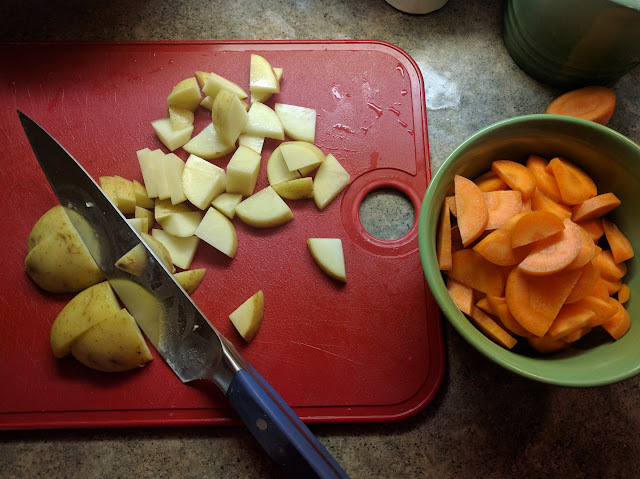 I like decent chunks of potatoes and carrots in this, but feel free to chop them up however you like. Basically what I do is slice in half, then half again, and finally another half and slice across, like with the potatoes above. 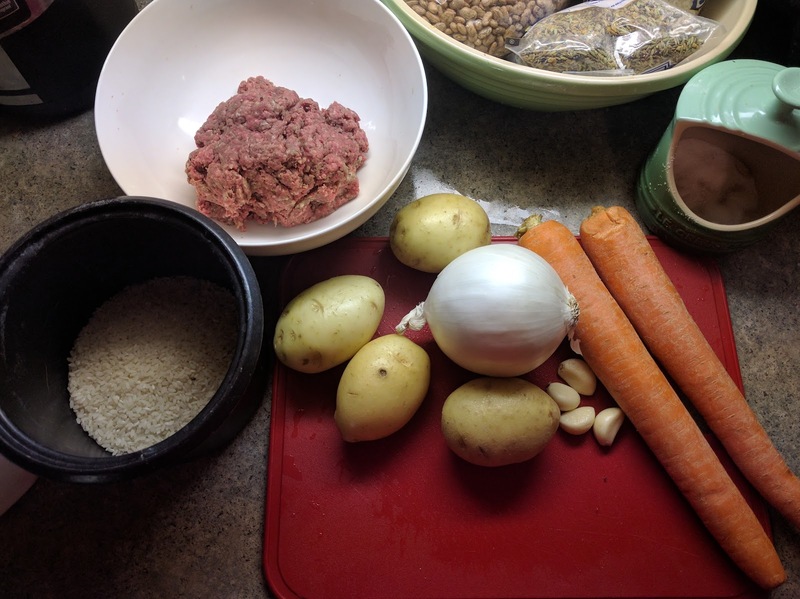 The picture for the raw meatballs didn't come out, but what you want to do with this is add salt, pepper, garlic powder to the ground beef. Then mix it all by hand until incorporated. Take pieces of the ground beef and roll in your hands. You are shooting for ping pong ball sized balls. 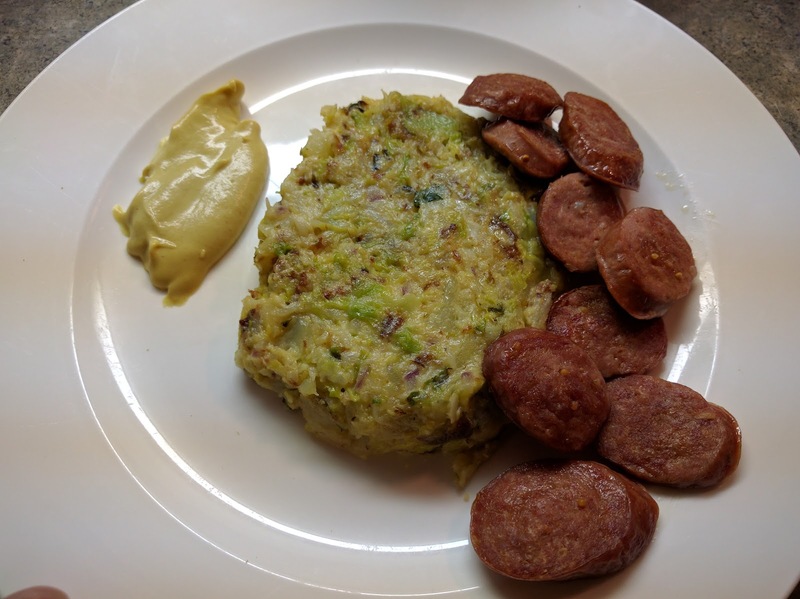 You can also use raw sausage since this is already seasoned. This is important: before adding the meatballs, make sure the water is boiling. The reason for this is the heat will kind of "sear" the meatballs so they stay uniform. If you started them cold and simmering in the water they are more likely to fall apart. Add the carrots and potatoes and lower to a simmer. let this go for 20 min over medium-low heat. The water should barely cover the ingredients. To begin, peel 1 potato, peel and chop into cubes. 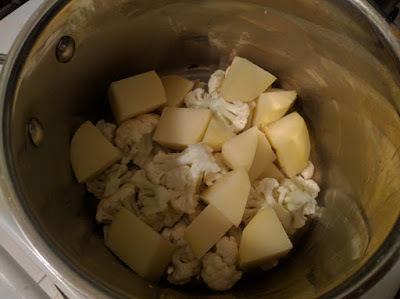 Then break off pieces of cauliflower until you have about 1 cup. You will place both of these in a small pot with chopped garlic and cover a little less than halfway with milk. Add a generous pinch of salt and pepper. Cover and let the ingredients simmer under medium-low heat for about 20-30 minutes, stirring occasionally. Keep an eye on the milk, if it is boiling too much vs a gentler simmer then lower the heat. You want to be able to eventually smash these so test after 20 minutes by pressing down on a potato with a wooden spoon. Cut the potatoes into smaller cubes so they cook more quickly. You will be able to smash the cauliflower/potatoes after a while. 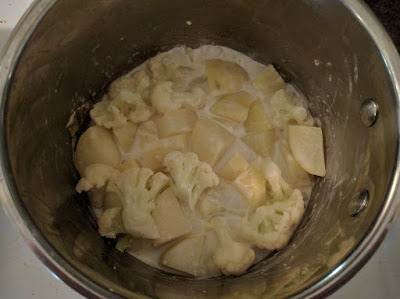 It doesn't need to be super smooth, you want some chunks of potato/cauliflower to remain for texture. 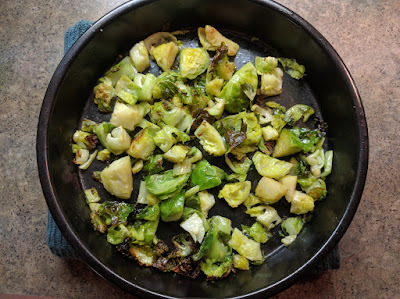 While the potatoes are simmering, chop the stems of of brussels sprouts, slice once lengthwise, then slice each half again, so you have four pieces, cut across these so then you have 8. Basically you just want to chop it up into smaller pieces. Add the brussels sprouts and cheddar to the potato/cauliflower mixture and stir. This is delicious as is, but you can also finish this by cooking in a flat pan with some oil or butter. Melt butter or heat up oil in a small pan and let it heat up. 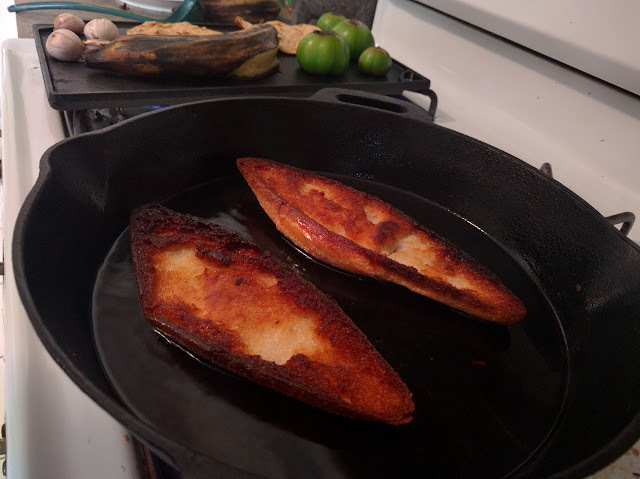 Use a nonstick pan if you have it. 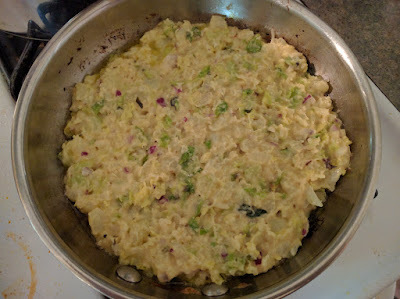 Spread out the mashed mixture and let it sit over medium heat for a few minutes. With a spatula check underneath to make sure it isn't burning. What you want to do is try to flip it or just scrape/stir after cooking for a bit. It won't get super brown but it'll all come together more like a little pancake. Serve with roasted meats or cooked sausages with some mustard on the side! I have always enjoyed cornbread. I love the texture and flavor of the corn meal, even better with plenty of honey butter to spread on top. 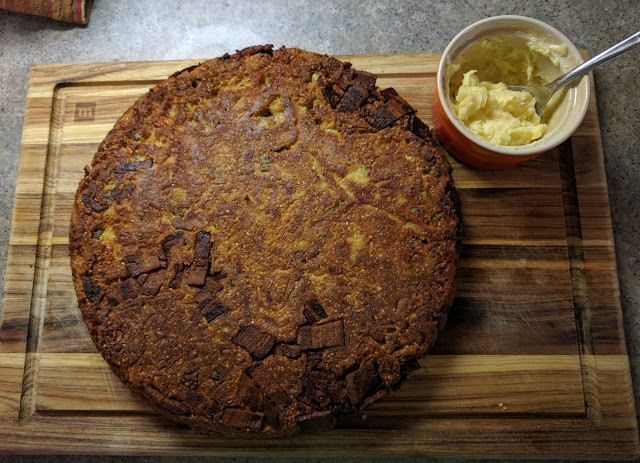 I never made a cornbread until about two weeks ago. The Kitchenista (@MissAngelaDavis) posted a very straight forward and very delicious thread and recipe related to cornbread here. Since then I have made 3 of them! It was delicious, you definitely get the pineapple but the bread is still very much savory. I had it with pulled pork and beans. 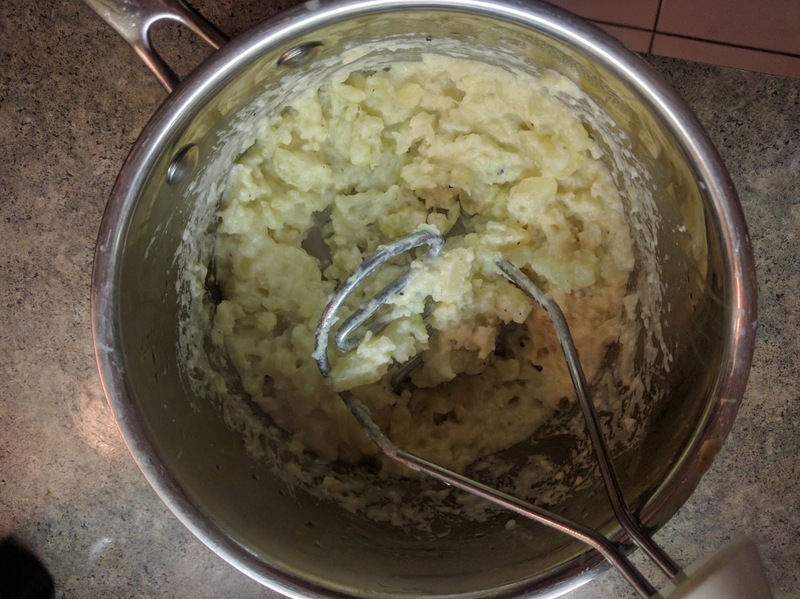 I'm sure I will have many more ideas with this easy and tasty batter recipe. 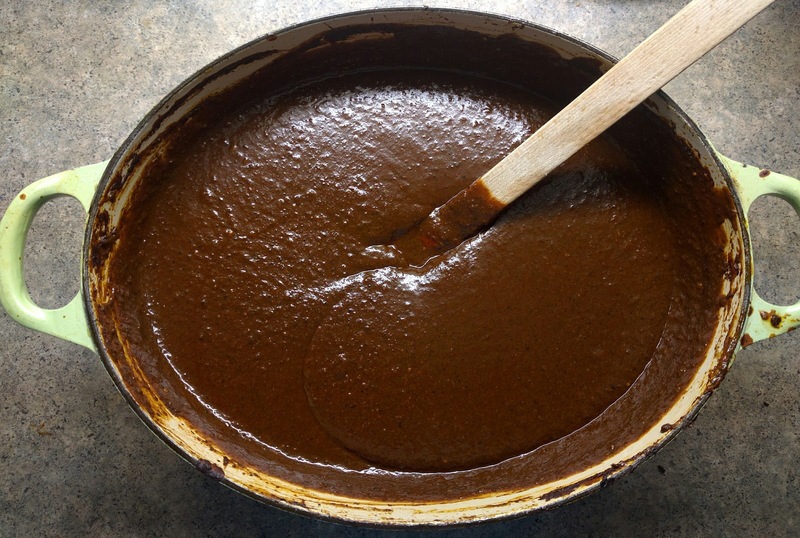 Growing up, it was very common to have mole from a store-bought mole paste which was prepared by adding more ingredients. This makes sense considering how time consuming the process can be, it is common to see various mole pastes for sale in markets. 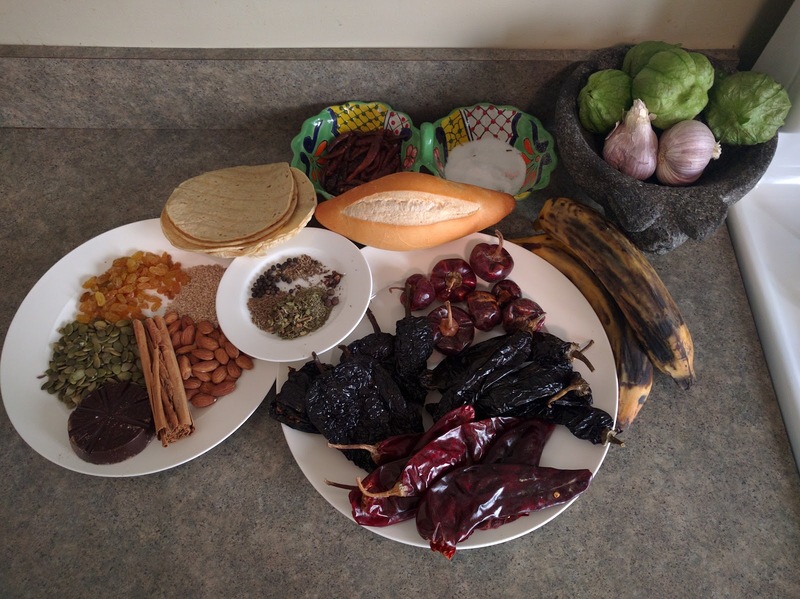 I wanted to make my own mole, preparing each individual ingredient, and balancing the taste out as necessary. I used as my source Diana Kennedy's The Art of Mexican Cooking. 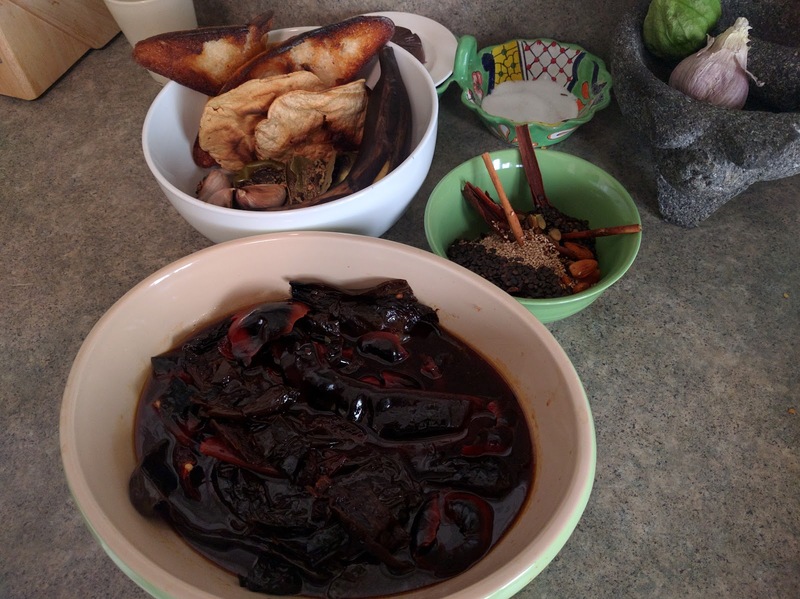 In there she has a recipe for Oaxacan black mole. I used some of the proportions as a guide but used some different ingredients I've seen also used in mole poblano. The process is fairly straightforward, it's just the amount that needs to be done. Each ingredient needs to be toasted on a comal. For spices and the sesame seeds I used a pan, just to make them easier to handle. 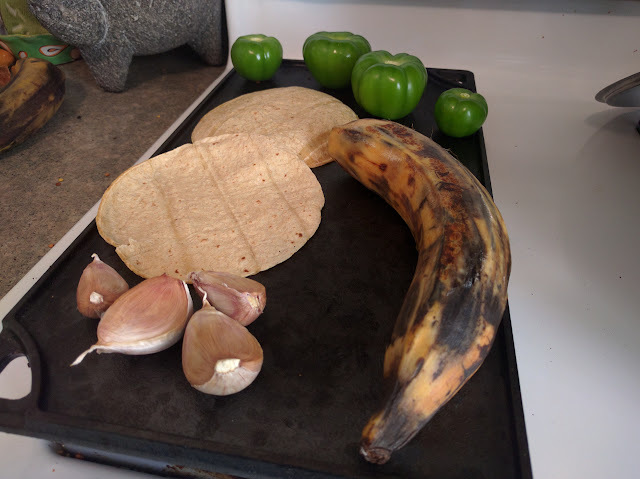 Traditionally a metate is used to grind all the ingredients into a paste, but I used a blender, adding just enough liquid at a time to get it going without make it too wet, it should still be a paste. Some more detailed steps are included in the recipe below. - Toast all ingredients on a comal until golden brown, except for chocolate. 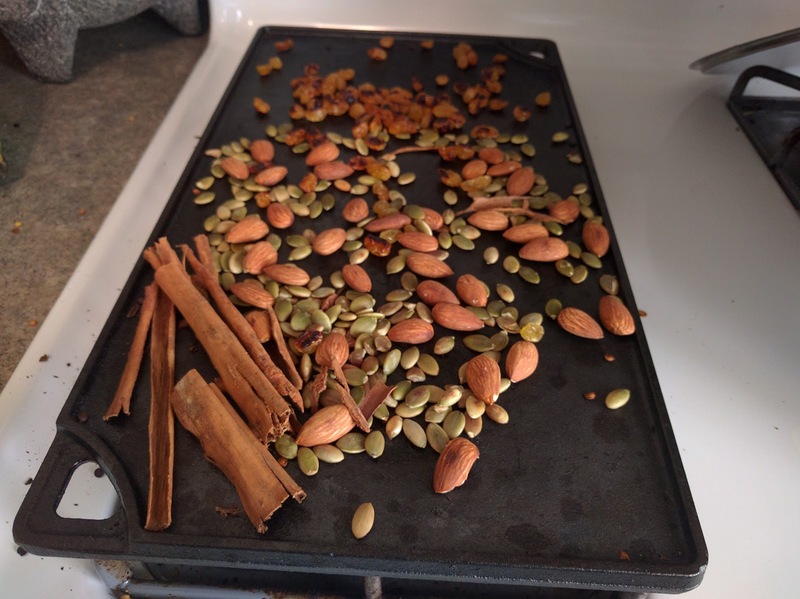 For small seeds, spices, herbs a sauté pan might work best and heat through until fragrant. - For chiles specifically: toast ancho and pasilla for 2-3 minutes on each side. Toast guajillo and cascabel for 4-5 minutes to get them very dark/black. Place in a bowl and cover with boiled water for 25 minutes. 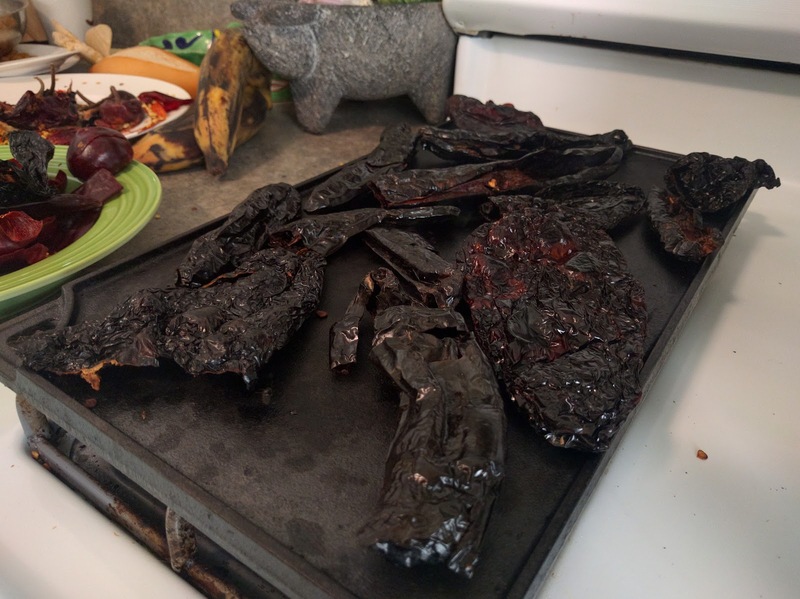 - Platano maduro can be griddled skin on, the heat will soften it. - For the bolillo: heat the lard until hot, fry the bread well on all sides. - This might need to be done in batches depending on the size of the blender. - Start with chiles and nuts/seeds as these will get the thickest. Add just enough water at a time to get the blender going, you may need to push ingredients down. - Blend the remaining ingredients, except for the chocolate, chicken, and lard. 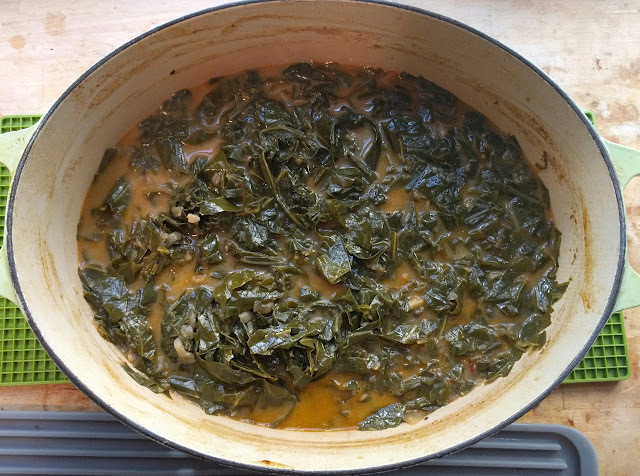 - Heat the lard in a large pot or dutch oven until very hot. - In one motion, pour all of the mole over the lard, the idea is to fry the sauce and cook it really well. Stir occasionally for 5 minutes. - After this point, add the chocolate and stir well so it can break up and get incorporated. 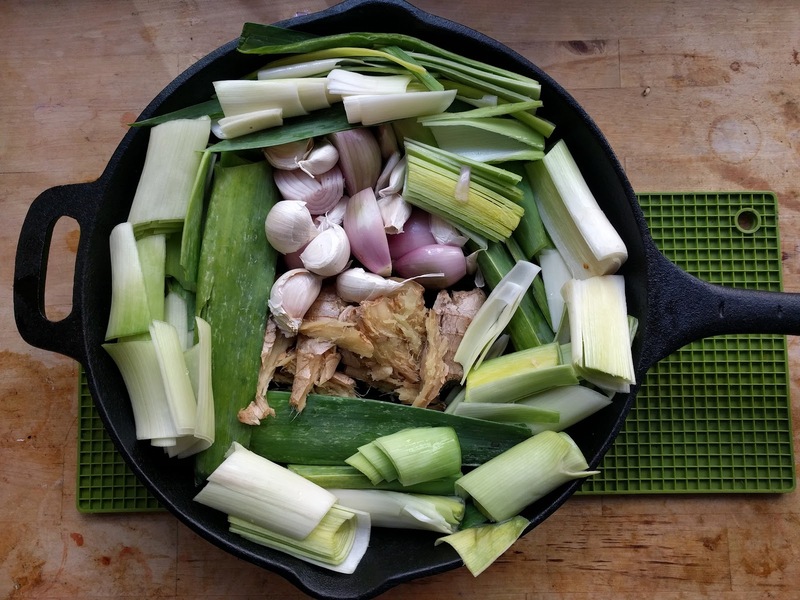 - Add chicken broth and allow this to simmer for an hour, stir frequently to avoid sticking. - Towards the end, use a stick blender to smooth out the sauce a bit more. Boiled shredded chicken mixed into the sauce what I grew up with and still my go to. I also really love just the mole over red or white rice, I really love the texture difference. The more traditional would be turkey meat, but beef and pork also work really well. It is a fairly versatile sauce given how complex it is. There is also nothing wrong with just drinking it out of a bowl, right? 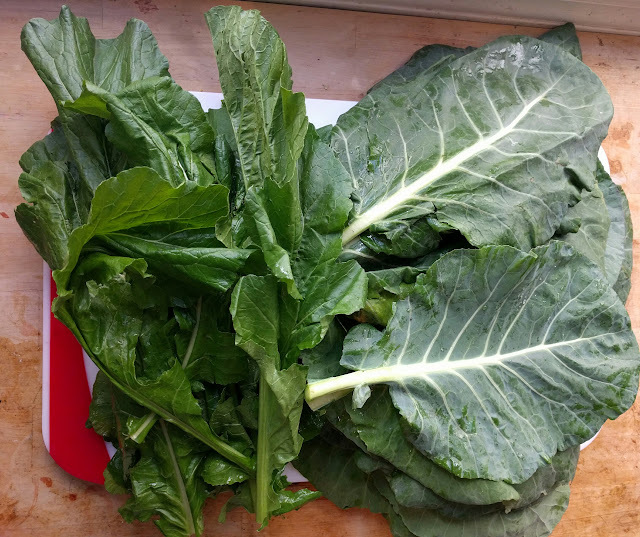 Collard greens are something I'm really been enjoying lately. When given the option, I'll get them. I love that they have a bitter and vinegary flavor, but also have a rich texture when eating. 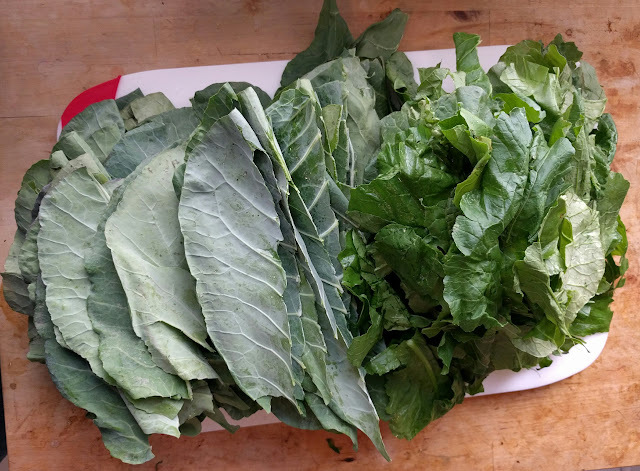 I have been wanting to prepare my own, so I did some research and saw a lot of the typical collards boiled with ham hocks or turkey necks. All of that sounded amazing, but coming across posts of people braising them in coconut milk with ginger really made me interested. I love cooking with coconut milk and I could already taste the flavors together. This was the route I wanted to take: greens braised in coconut milk and a veggie broth with roasted aromatics, ginger, garlic and gochujang to add some heat and umami to the dish. I had a box of veggie broth to use as braising liquid along with coconut milk, but I wanted to add a lot of additional flavor, specifically the taste of roasted aromatics like leeks, ginger, garlic and shallots. I placed this in the oven at 500F for about 20 minutes then turned them halfway through to get a nice amount of color on everything. I added these to the vegetable broth and boiled. In the meantime, I started to prepare the greens. For this dish, I'm using mostly collard greens, but I did pick up some turnip greens as well. 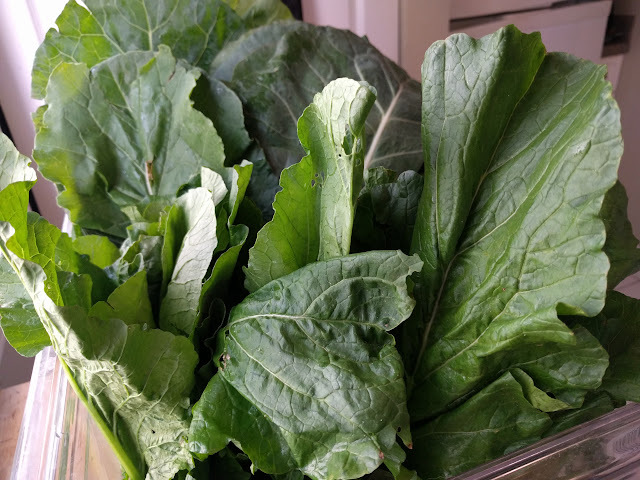 As far as I can tell the turnip greens are more tender and not as bitter as collard greens. To begin preparing them, I removed the thick middle stem from the greens. This was probably the most time consuming part of the dish, but it was also relaxing to focus on one thing for a while. After removing the stems, I rinsed off the greens, rubbing them to make sure the grit comes off. After the initial wash, I did my best to stack the collard greens, starting with the biggest leaves and placing smaller ones on the inside. From here, they can be rolled up into cigars as shown above. 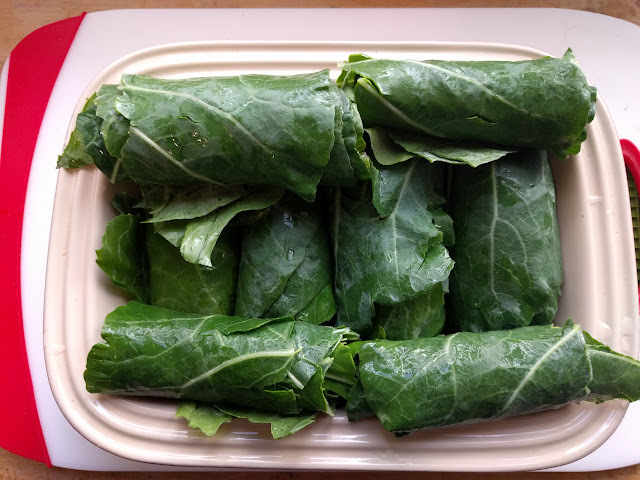 I like doing it this way because you can slice across the rolls and make really nice strips of collard greens. After this it is time for another rinse to make sure they are very clean before cooking. 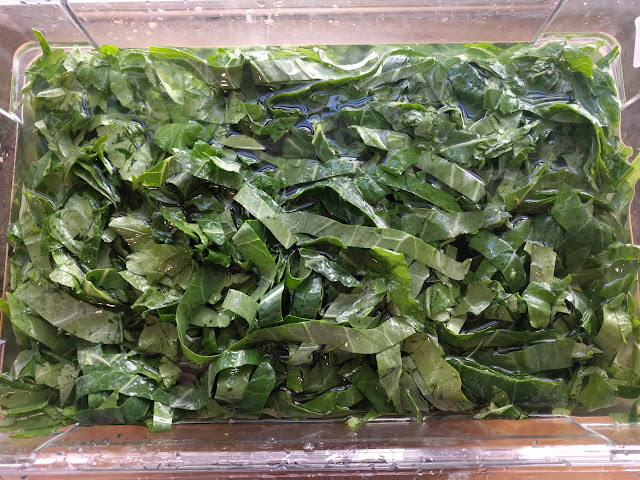 This is my favorite part of the process, I just think it is very pretty to see the ribbons of greens floating in the water. I like the texture as I run my hand through the water to shake the greens out a little. By this point, I strained my aromatics from the vegetable broth and set to the side. In the same pan I sautéed onion, garlic and ginger in coconut oil. Once these softened, I added a couple of tablespoons of gochujang. This is used to add spice as well as umami flavors to the greens, I have used soy sauce and sambal previously which also work well. 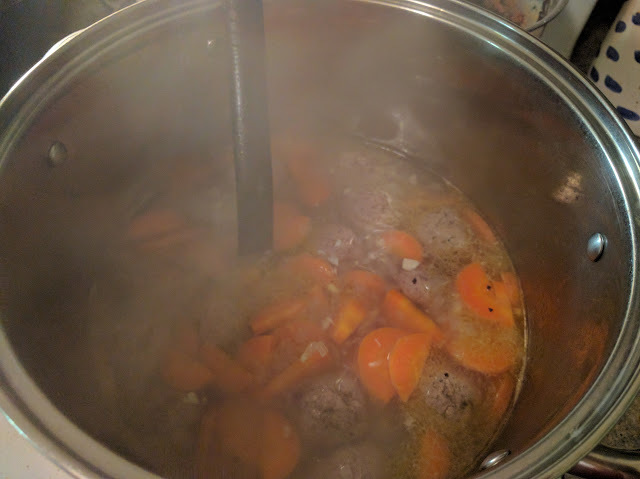 I added a couple of cans of coconut milk and let it come to a boil. 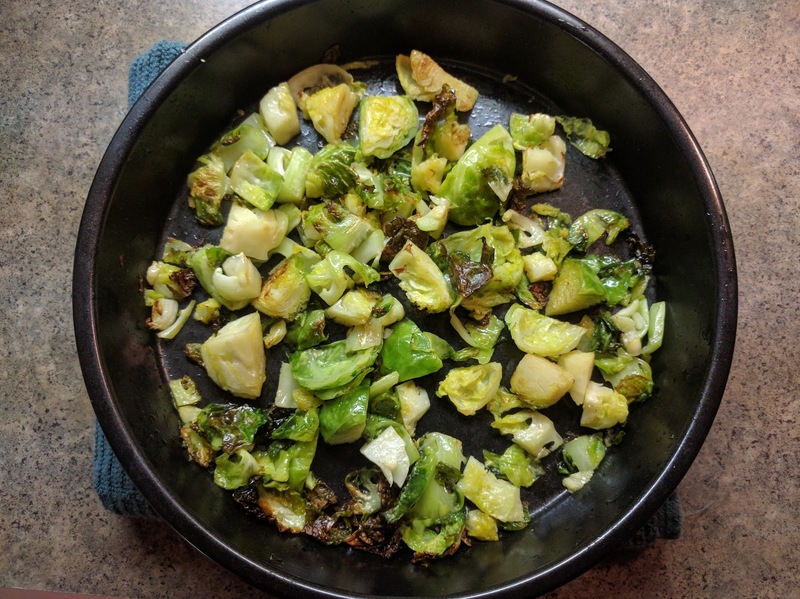 I reduced the pan to a simmer and added all my greens. I let them braise on low for 2 hours, they should be tender but still with some texture, maybe around al dente. Being hearty greens they should hold up as long as it was a low simmer. They will wilt and reduce in size significantly, releasing their juices into the broth making a nutrient rich and delicious pot liquor. You should definitely drink all of this up, or us it for a soup the next day. To finish, I seasoned with salt, pepper, and a couple of tablespoons of vinegar (I did half rice and half white vinegar). The greens were delicious, the gochujang added a nice layer of flavor that went well with the coconut milk and ginger. 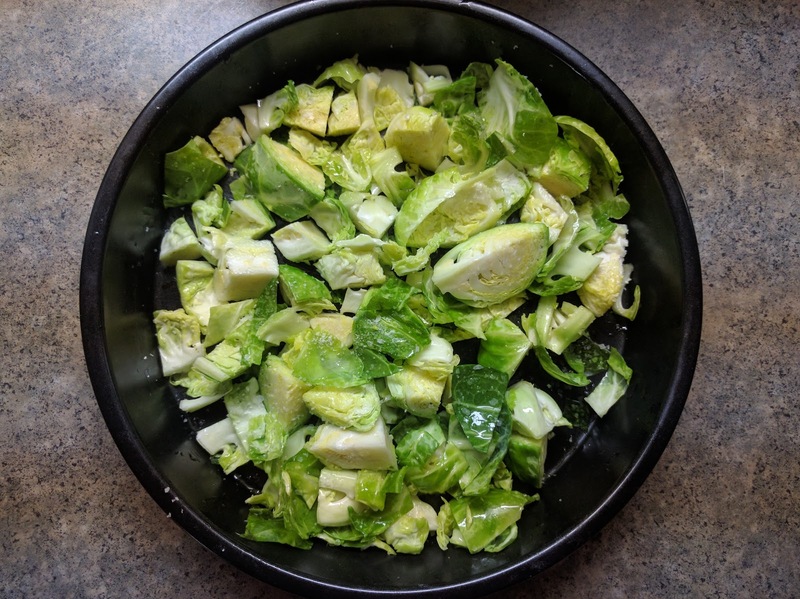 I love the texture of the greens cut in ribbons and their bitter taste balance with coconut, vinegar, and heat make them very satisfying and nourishing. This is something that can be served as a side, or my favorite: served as is over white rice, mmmmmmm. 1. 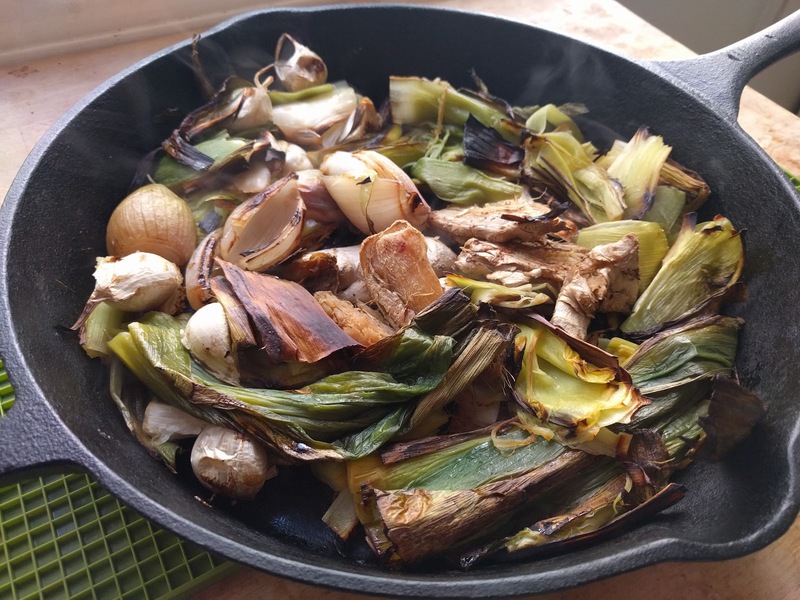 Begin by roasting sliced leeks, crushed garlic, unpeeled garlic cloves and shallots in a very hot oven. The goal is to get a nice dark brown color or even some charring on them. Turn halfway through to get color on the other side. 2. Add all of the roasted aromatics to a pot with the vegetable broth and bring to a boil, simmer for at least an hour. 3. 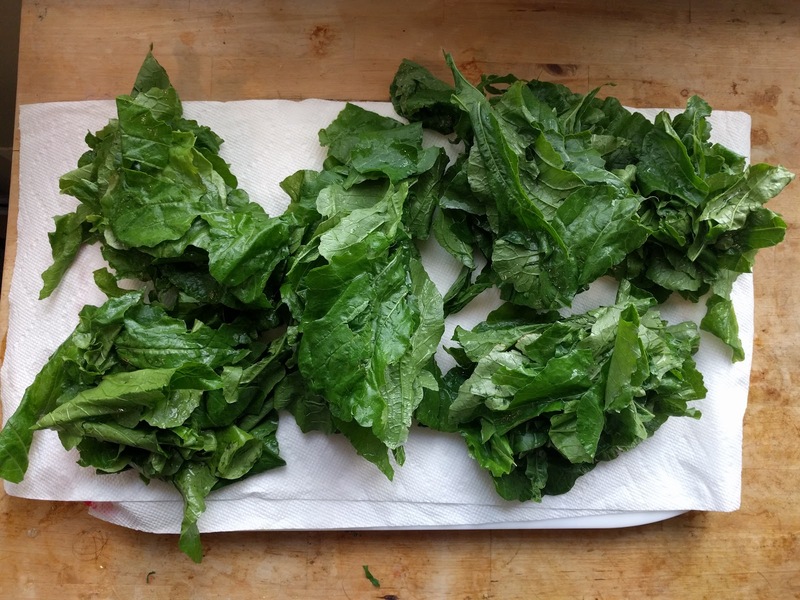 In the meantime, remove stems from all of the greens and wash by hand. This is easiest in a clean sink or a large container of water. Once this is done, lay the greens flat, starting with the biggest leaves, maybe 10-15 leaves each. 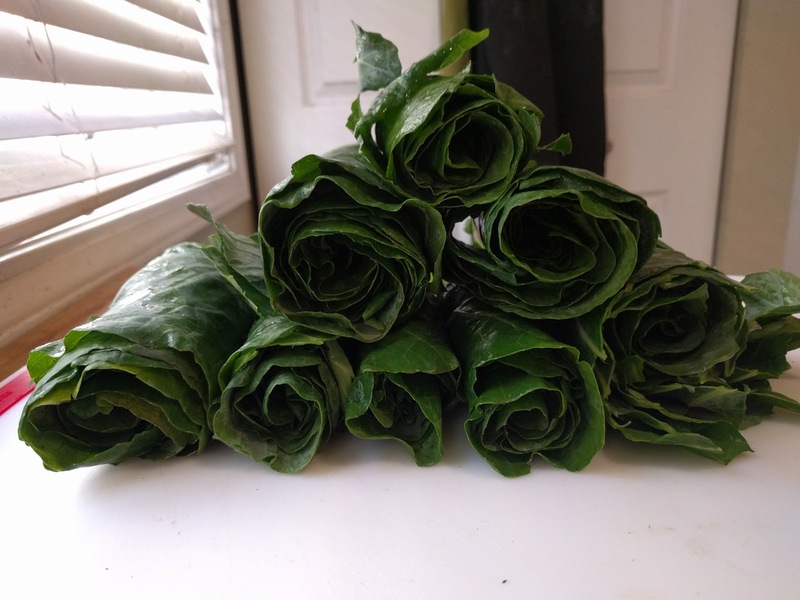 Roll each pile of leaves into cigars and cut across to create ribbons. Place these in a large container filled with water to rinse once last time. 4. Strain the broth, in the same pan sauté onion, minced garlic and ginger until softened. Add the gochujang to and cook for another minute before adding the vegetable broth and coconut milk, bring to a boil for 15 minutes. 5. 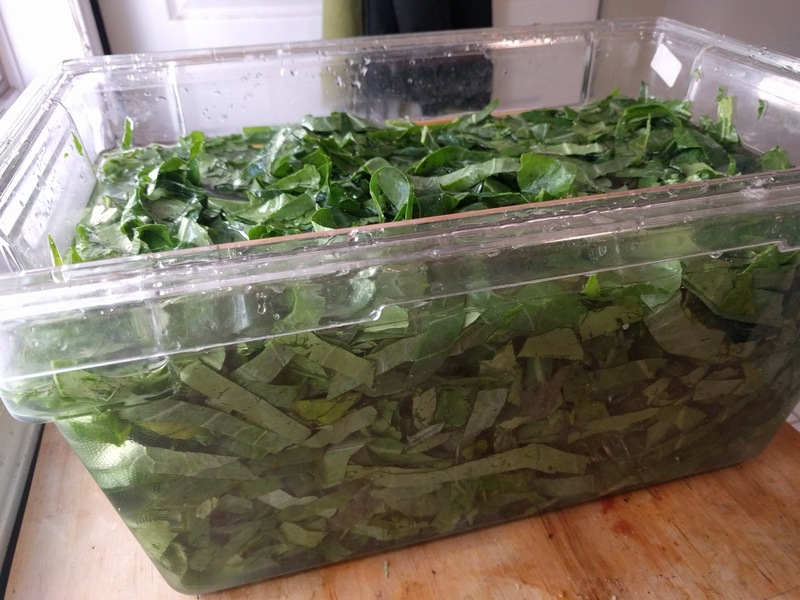 Add all of the greens, if there is not room stir to start wilting them, they should reduce in size significantly. Reduce heat to low and simmer for two hours, stirring occasionally. 6. To finish, stir in vinegars as well as additional salt and pepper to taste. I really love a regular, basic sloppy joe. It is a comfort food for me. In college it would be a cheap and easy go to go with anything from a hangover to the munchies. I guess the same can be said about al pastor tacos, and this is why I combined them into a delicious, sloppy sandwich. 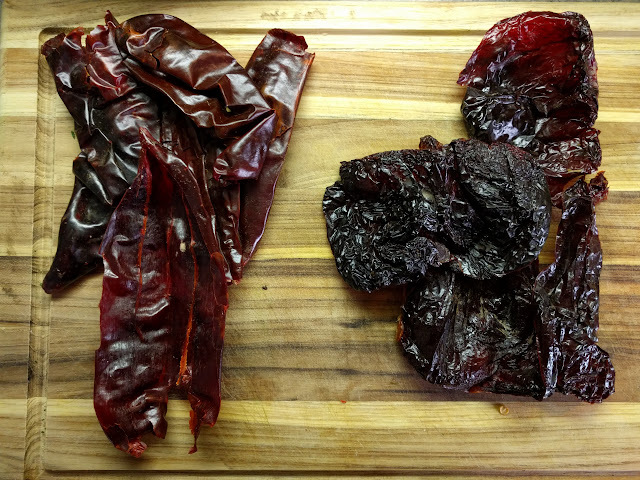 Chile guajillo on the left and chile ancho on the right before and after roasting in the oven. 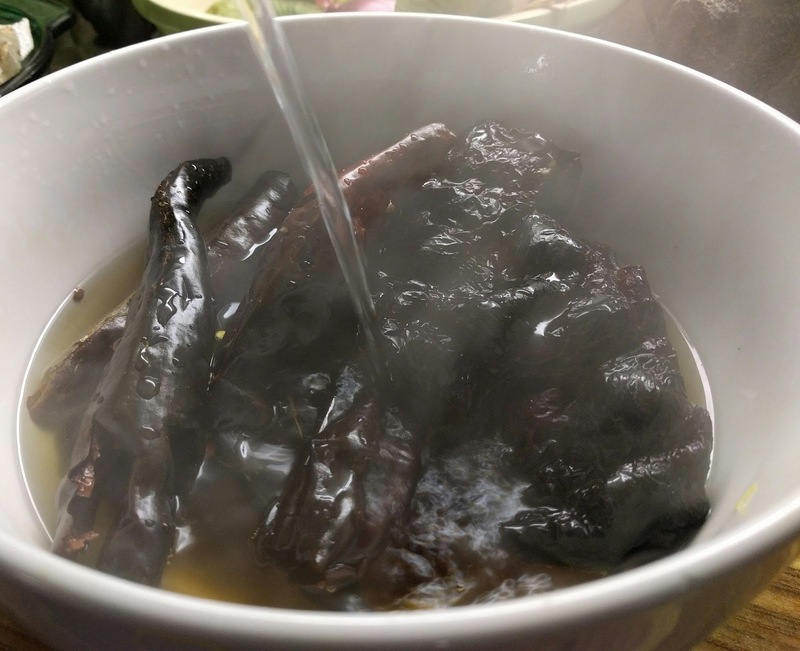 Adding boiling water to the dried chiles and covered for 20 min to soften. 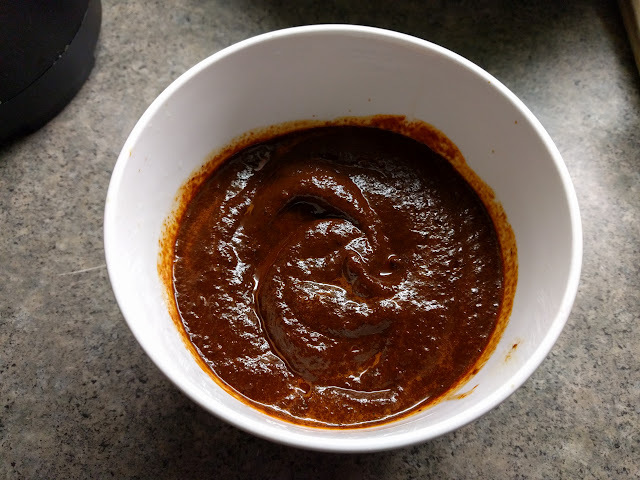 This is the guajillo/ancho paste after blending with some of the steeping liquid. I blended this with pineapple, chipotles, cumin, oregano, bay leaves, roasted garlic, salt, and pepper. I then heated oil and pork fat until smoking and poured in the sauce to fry it. I brought it to a boil to denature the enzyme in pineapple that breaks down pork to avoid mush. 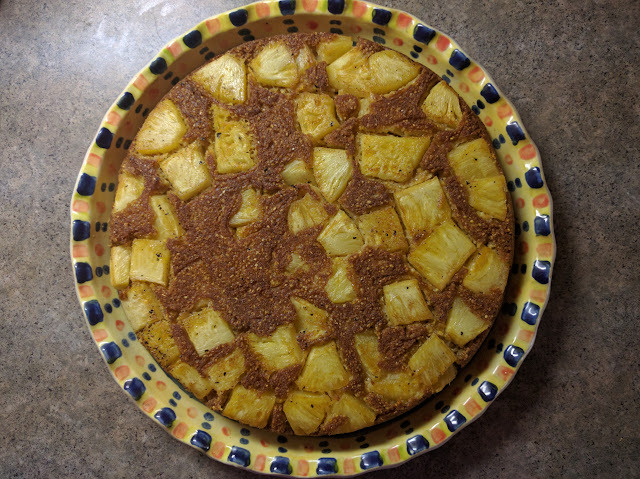 I mixed some of the cooked al pastor sauce with browned ground pork and spread in a baking dish. 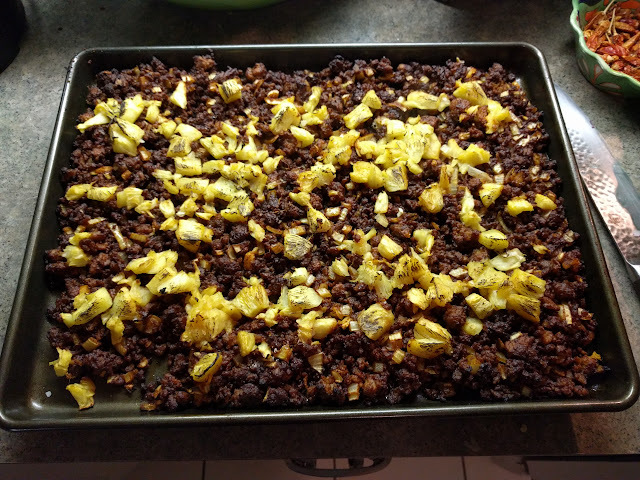 I topped with chopped up pineapple and roasted on the highest setting to brown and crisp. 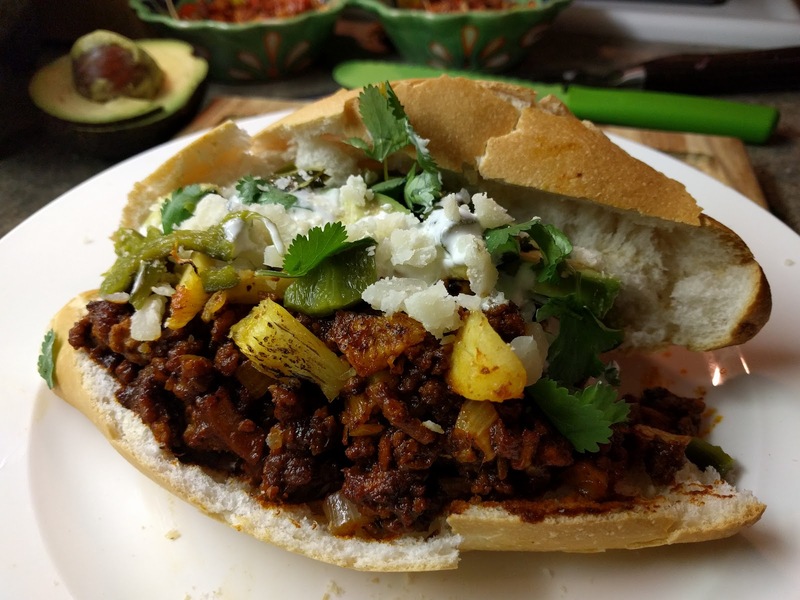 The sloppy joe was served as a torta on a toasted bolillo with avocado, rajas, crema, manchego cheese and cilantro. I spread additional al pastor sauce on the bottom half of the bolillo. There was a great amount of heat coming from the sloppy joe without being overwhelming. The sweetness of the pineapple with spicy pork is always something I always love together.